Ambience: The 64 cover restaurant is done up in all shades of brown that lend it a natural sense of warmth. The best part is that it overlooks the manmade lake at Orion Mall so make sure you get a seat towards the end of the restaurant as it makes for a great setting to enjoy your meal. What we ate and drank: The wonders of gourmet European cuisine are recreated at Café Mangii. 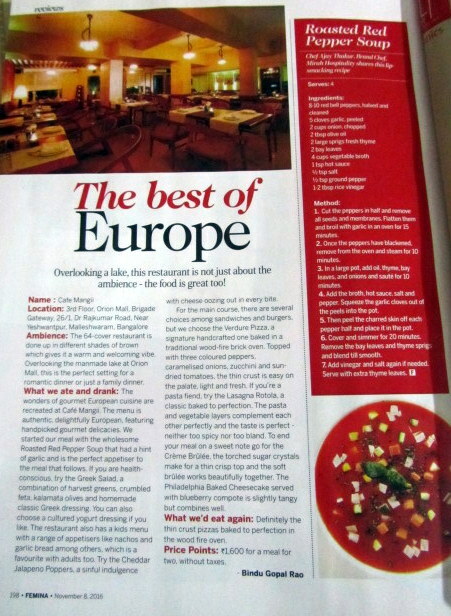 The menu is authentic, delightful European cuisine and this casual all-day diner offers handpicked gourmet delicacies. We started our meal with the wholesome Roasted Red Pepper Soup that has a hint of garlic and is the perfect appetizer to the meal that follows. If you are a health freak, try the Grecque salad, a combination of harvest greens, crumbled feta, kalamata olives and homemade classic Greek dressing. You can also choose a cultured yogurt dressing if you like. The restaurant also has a kids menu with a range of appetizers like nachos and garlic bread among others – favourites among adults too. Try the Cheddar Jalapeno poppers a sinful indulgence with stuffed cheese that oozes out when you bite into it. For the main courses there are several choices among sandwiches and burgers but we choose the Verdure Pizza a signature hand crafted one baked in a traditional wood fire brick oven. Topped with three coloured peppers, caramelised onions, zucchini and sun dried tomatoes, the thin crust is easy on the palate and is light and fresh. Among the pasta the Lasagna Rotola a classic baked to perfect is recommended. The pasta and vegetable layers complement each other perfectly and the taste is perfect – neither too spicy nor too bland. To end your meal on a sweet note go for the Crème Brûlée, the torched sugar crystals make for a thin crisp top and the soft brûlée works beautifully together. The Philadelphia baked cheese cake served with blueberry compote is slightly sour and blends well. The Tiramisu with its coffee flavour is delicious too – just don’t count the calories. 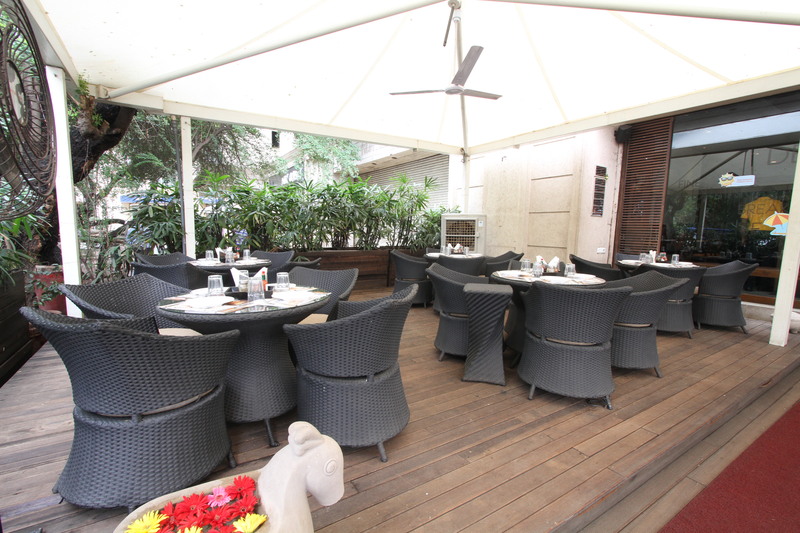 If you are looking for a meal in a casual atmosphere, head to Cafe Mangii – it is a place where great food meets a great ambience. What we’d eat again: Definitely their thin crust pizzas baked in the wood fired oven to perfection. 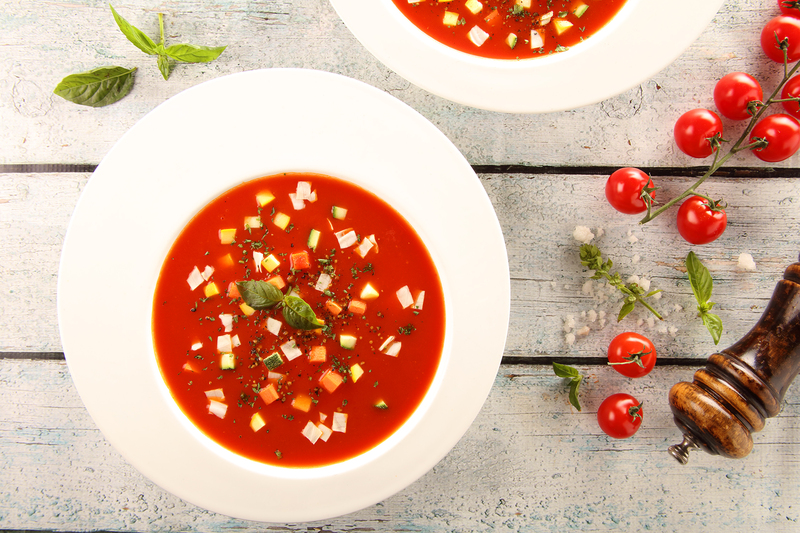 Here is a recipe of Roasted Red Pepper Soup from Chef Ajay Thakur – Brand Chef, Mirah Hospitality. Reduce the heat, cover, and cook another 20 minutes. Remove the bay leaves and thyme sprigs. Then, using a hand-held immersion blender or standard blender, blend until smooth. Add the vinegar and salt again if needed. Serve with extra thyme leaves.